Oppenheim, Alan V., Ronald W. Schafer, and John R. Buck. Discrete-Time Signal Processing. Upper Saddle River, NJ: Prentice Hall, 1999, pp. 788–789. Steiglitz, K., and B. Dickinson. 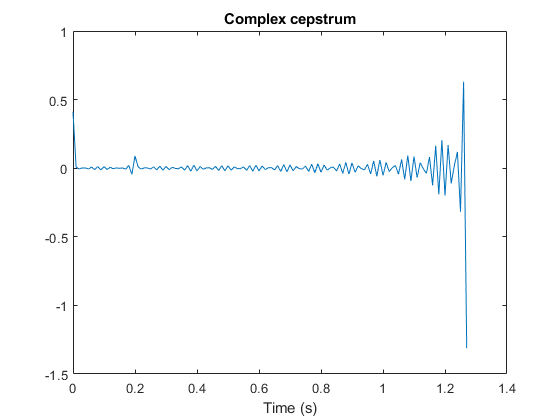 “Computation of the Complex Cepstrum by Factorization of the Z-transform.” Proceedings of the 1977 IEEE® International Conference on Acoustics, Speech and Signal Processing, pp. 723–726. Digital Signal Processing Committee of the IEEE Acoustics, Speech, and Signal Processing Society, eds. Programs for Digital Signal Processing. New York: IEEE Press, 1979.